I originally made this dish for Janine back when we first started dating. It was one of those nights where we arrived home late and we were both dead tired. Neither one of us wanted a dining experience. We just wanted fuel. After taking a quick inventory around the around the kitchen, I decided to fall back on to one of my old standards, Pasta with Chick Pea Sauce or Pasta e Ceci. This dish is a holdover from my Bachelor days. Chronologically, the first time I made it was somewhere between college graduation and cooking school. Back then, it was something I made quite regularly. The recipe was quick, easy, and only required one pot. The end result was tasty and filling but nothing really special. At first, I was reluctant to serve it to Janine because I did not think she would like it. I was still trying to impress her at this stage of our relationship and feared a big hearty helping might send her packing. Maybe if I down-played the dish, she would be a little more forgiving. “What are you making”? She asked, creeping up from behind as I worked in the kitchen. “A big pot of gruel…” was my reply, trying my best to manage her expectations. “Who am I, Oliver Twist?” was her response as I ladled a big scoop into her bowl. She finished her portion without any reluctance or criticism. I chalked it up to her being polite. Or maybe this was playing out like a Dickens orphanage scene and she was afraid to complain for fear of repercussions? After a while, she started asking for the dish by name. “What do you want for dinner?” I’d ask. “How about a big pot of gruel?” Would sometimes be her reply. I knew the dish had merit when she kept asking for it. Continuing to call it gruel was a disservice. Eventually, we had to rename it. 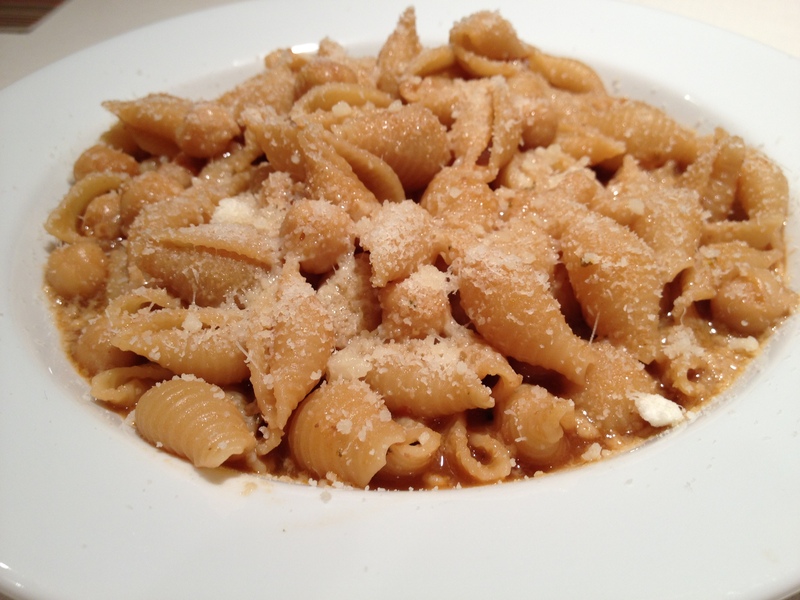 Although it is commonly known as Pasta e Ceci, Pasta with Chick Pea Sauce seemed like a natural choice for us. Place Chick Peas in a colander and rinse under cold water. Set aside for later use. Choose either a sauce pan or Dutch Oven large enough to hold all of the ingredients. The pan should have a tight fitting lid. Add the Olive oil to the pan and heat over a medium low flame. Add the Garlic. Sauté until lightly brown. Add the Red Pepper and Rosemary. Stir a few times until herbs become fragrant in the hot oil. Add ½ cup of Chick Peas. Stir a few more times until they are coated with oil. Add Tomato paste. 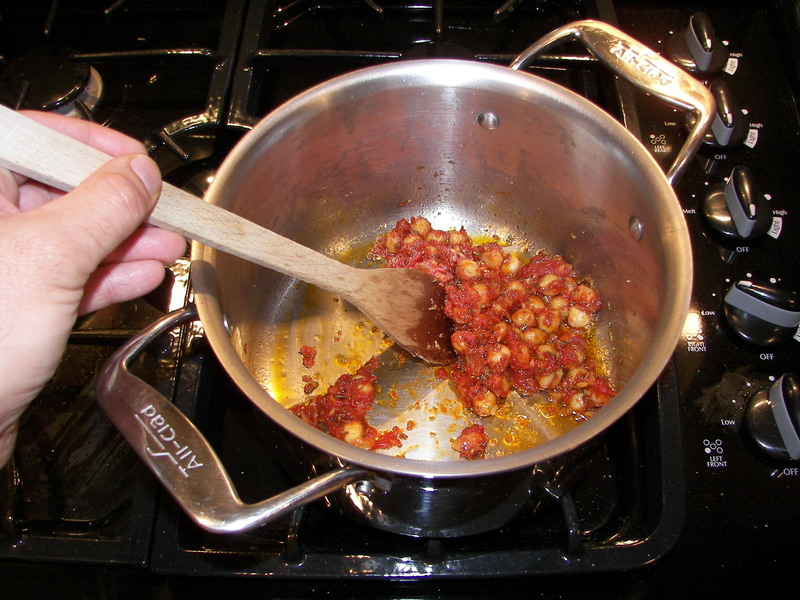 Sauté until the Tomato Paste has thickened slightly and chick Peas are thoroughly coated. Add beef btock. Raise flame to high and bring beef Stock/Chick Pea mixture to a boil Stir constantly to dissolve Tomato Paste. Turn off heat. 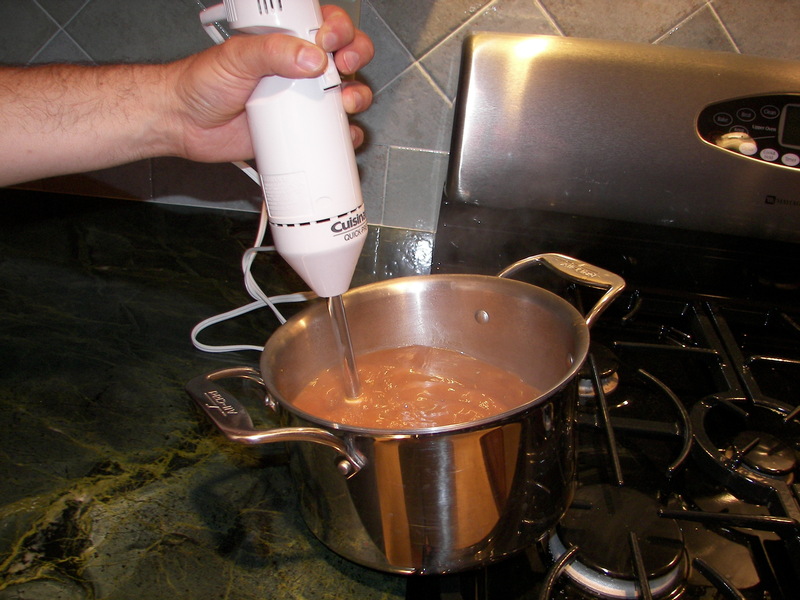 Using an Immersion blender, puree the Chick Peas until they have been thoroughly blended with the Beef Stock mixture. 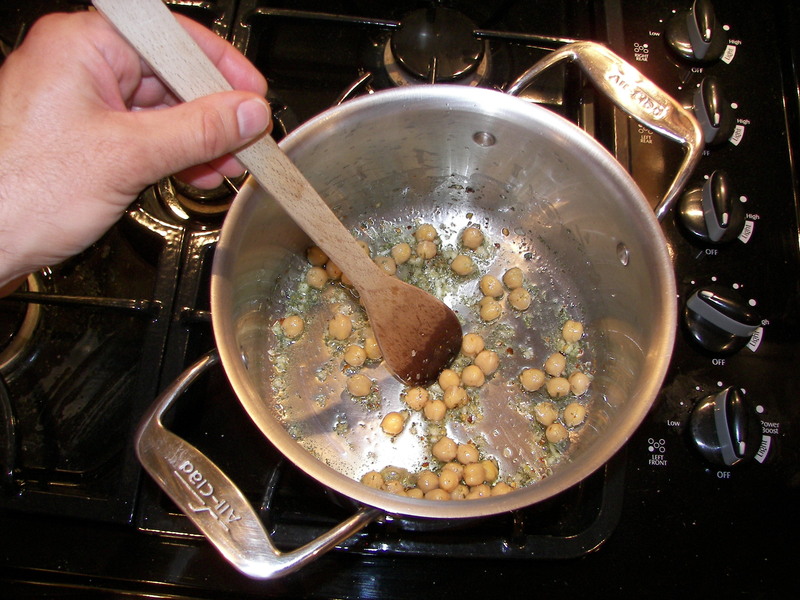 Note: a regular blender can be used to puree the chick Peas, but an Immersion Blender will be quicker and leave less mess. Since the salt content can vary in different varieties of beef stock, taste the sauce after the Chick Peas have been blended. Adjust the seasonings accordingly. Remember, the pasta will absorb some of the salt from the sauce and the Grated Parmesan will add some back. Cover pan and bring to a boil over high heat. Add pasta and stir to ensure the individual pieces do not stick together. Lower heat to medium high and simmer until pasta is al dente. The goal is to reduce the sauce just enough to concentrate the flavors but not so much that it becomes gloppy. There should be about two-to-three cups of sauce left in the pan when the pasta is fully cooked. Use the pan’s cover to control the rate of evaporation. Cover the pan entirely while the pasta is cooking if too much liquid is being lost. Uncover it if too much liquid remains. Reduce heat to the lowest setting once the pasta is cooked. Add butter and stir until fully melted and combined with sauce. Turn heat off. Gradually stir in grated Parmesan Cheese. Note: The amount of butter will dictate how much grated cheese the sauce can absorb. More butter will be required if you desire to add more cheese. A good indication of the proportions being out of balance is when the cheese starts clumping to the spoon and sticking to the bottom of the pan. Add the Chick Peas after the cheese has been incorporated into the sauce. Stir to combine. Cover the pan and let stand off heat for a few minutes. The residual heat from the pan will warm the Chick Peas and cooking the dish. 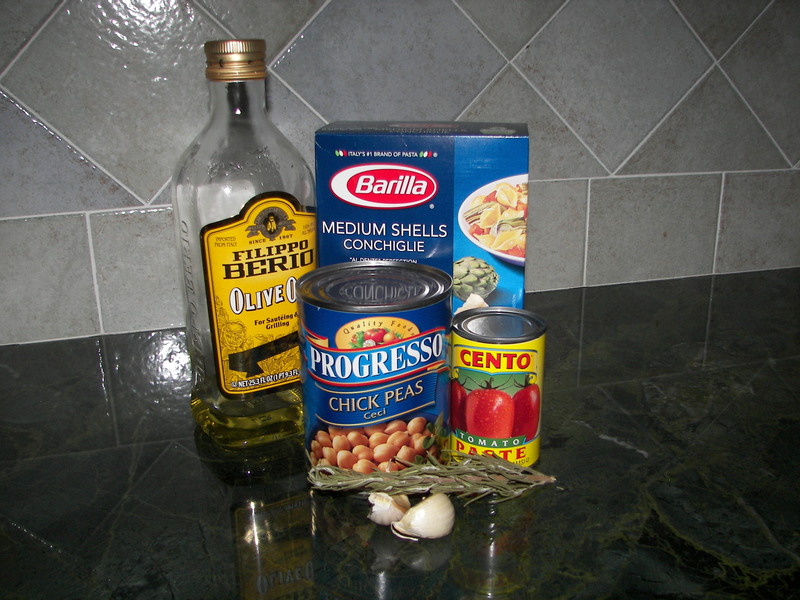 Note: I like to stir the mixture until some of the Chick Peas work their way inside the pasta shells. 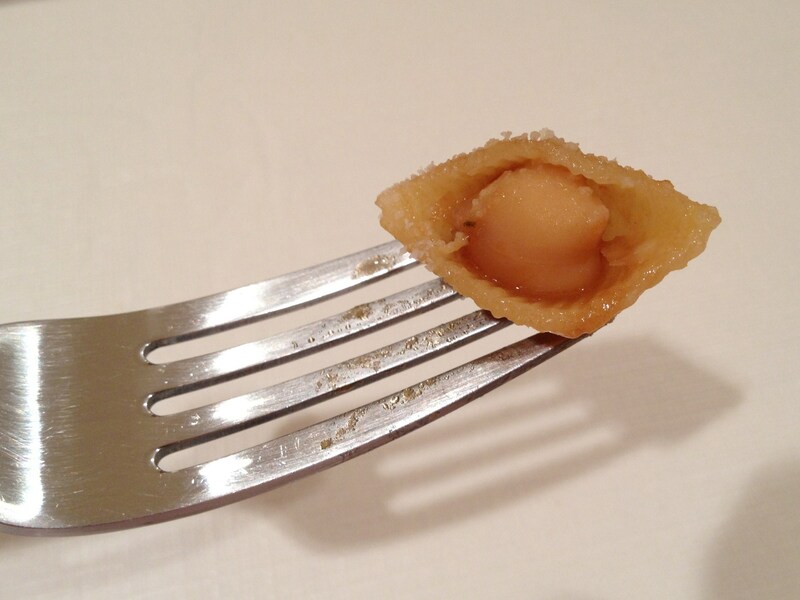 This creates a miniature open faced ravioli or tiny stuffed shell. my mother has been making a chick pea sauce like this in recent years and it’s delish! Thank you for visiting our blog. We really appreciate it. This type of recipe is comfort food in our family. It’s quick, easy, and only requires one pot.